Finding out you’re pregnant is an exciting time, but it’s also a scary one, especially if it’s your first time. You don’t know what to expect or how to become the type of parent who inherently knows what to do. Put those fears at bay, though, because there are no perfect parents. In fact, most parents figure things out through good old fashioned trial and error and gut instinct. Additionally, the internet has made it a little bit easier to figure out what to do in times of uncertainty, and we’ve handpicked these 100 blogs that are packed with tips and tricks for navigating through the somewhat murky waters of parenting so that you can breathe a little easier during each phase of life. Doctors will tell you that no two pregnancies are exactly alike, even with the same woman. However, many women experience similar things during pregnancy, which can help you get a general idea of what to expect. These 10 blogs will guide you through different common pregnancy occurrences, and help you have the best pregnancy experience possible. Fit Pregnancy—Moderate exercise throughout pregnancy can help you have a smoother delivery. Smart Parenting Advice—You’ll find a list of common pregnancy symptoms on this site and more. Be a Perfect Parent—You can avoid leg cramps while sleeping by staying hydrated, stretching before bed and eating potassium-rich food. iVillage—Learn how to properly install and put your newborn in a car seat. Pregnancy—Learn some of the symptoms of pregnancy and what you can do about them. Health—Find out whether all of the advice that you are being given is fact or myth. Healthy Women—Read this list of pregnancy do’s and don’ts, like what you should and shouldn’t eat while you’re pregnant. Mayo Clinic—Take a look at the week-by-week description of what you can expect while pregnant. Baby Center—Dealing with restless leg syndrome while you are pregnant is uncomfortable; learn how to treat it here. Modern Mom—Find a list of things that you need to do once you find out your pregnant, as well as tips for a first time pregnancy. Once you give birth you are probably going to experience a myriad of emotions, and you’ll likely be feeling overwhelmed and nervous about the large responsibility you suddenly have tasked to you as you care for your little one. You’ll also find that people won’t hesitate to give you advice about what you should and shouldn’t be doing, and it can be hard to determine which advice to follow and which to discard. That’s where these blogs will come in handy. Whatever you’re experiencing with your little one has likely happened to someone else who has posted about it. Check out these 10 blogs to navigate through any uncertainties you face during your first year. Kids Health—This article offers helpful tips for newborn care. La Leche League—Any questions you may have about breast feeding can be answered with the help of this site. Healthy Children—Infants will quickly develop their own personalities and way of communicating, so read this article to find out what you should know. The Bump—Tips for soothing a sick baby are covered on this site, along with many other topics that you may find interesting. Fisher-Price—On this site you can find out what toys are appropriate for your child during different stages. Ask Dr. Sears—This well-known doctor has written several books on caring for children and has a website that is full of information. Infant Sleep—For answers to any and all questions you have regarding your infant’s sleep patterns, look no further than this site. Parent Savvy—Find out how to properly diaper your baby here. New Parent—Learn recipes for making your own baby food and find out how to give your baby a bath. Child Development Institute—You will get a lot of unsolicited advice as a new parent, and this article will help you know how to handle it. The toddler years can be a roller coaster of emotions. Your little one is beginning to spread his wings and test his boundaries. It’s your job to let him grow and learn, but also keep him safe in the process. Toddlers are also prone to tantrums because they don’t yet know how to properly verbalize their feelings and frustrations. It’s imperative that you know how to deal with these tantrums as they arise. Check out the advice in these blogs to learn what to expect throughout the toddler years and how to handle issues that may come up. Aha Parenting—The Terrific Two’s Stage is discussed in this post, and you’ll find suggestions about how to cope with some of the challenges you may face during this time. CDC—The Centers for Disease Control and Prevention has information to help you through all the stages of development. Kid Spot—Read about disciplining tips for your toddler here. Parenting My Toddler—Tons of toddler advice is available on this site, including this article about picky eaters. ABC—Learn the ABC’s of parenting on this site by reading articles like this one that cover toddler behavior and what you can do. Disney Family—You can find a lot of articles about toddlers and their tendencies here. Everyday Family—Having a bedtime routine for your toddler will set him up for success and reduce your stress when it’s time for bed. Family Education—Take note of these 10 tips for dealing with toddler tantrums in a way that ensures both you and your child stay calm. Baby Zone—Start your toddler on these eight chores that he can do around the house. Focus on the Family—Read this article about potty training your toddler and see if he is ready to get out of diapers. Every stage has its fair share of challenges. While each child is different, the preschool stage is one that is marked by curiosity. You may get a lot of ‘why’ questions at this stage. Some questions you will be able to answer and others you may not know how to respond to. Don’t feel like you have to know everything just because you are the adult. Showing your preschooler how to look up answers to questions is an important skill to share. Advice for raising your preschooler can be found in these 10 blog posts. Get Ready to Read—Follow these tips for preparing your preschooler to start learning how to read. Scholastic—Prepare your child to attend preschool by implementing the tips covered in this article. Today—Learn tips for picking the best preschool for your child by reading this post. Parent Further—Prepare your preschooler for school by planning ahead for things they will encounter, as discussed in this article. Empowering Parents—What to expect when you put your child in preschool and what questions you need to be prepared to answer are discussed in this entry. Building Blocks—This site emphasizes the importance of communication with your child. PBS Parents—As a broadcaster of children’s programming, PBS (Public Broadcasting System) stays up to date on the latest information for children. The Hanen Centre—Read this important article on the affects watching TV may have on your preschooler. Ask Dr. G.—There are a series of video clips on this site where the doctor answers tough questions that you might be faced with from your child. Nick Jr.—This site has games and activities available for your kids to play. Be prepared to enter a whole new chapter of life as your little one prepares to start school. This period can be emotionally difficult for many parents, as well as scary for your child. Reading tips and advice ahead of time can help you prepare for any problems you may encounter as they arise. Listen to your child, even if it seems like he never stops talking, and check in with him often to make sure he isn’t being bullied or having any problems in school. You’ll find advice for coping with your child going to school and any problems he may face in these 10 blogs. Kid Pointz—How do you handle backtalk? The answer can be found on this site, along with many other parenting tips. Modern Parents—Read these 10 tips about elementary aged kids and learn why it’s important to listen to your child at this age. Social Moms—Praise your elementary student more than you correct him. Quick and Dirty Tips—Teach kids about diversity by talking about different cultures and trying foods from different countries. Tree Hugger—Learn why first born children often perform better than their younger siblings. Our Feminist Playschool—Read these tips for helping your child avoid bullying. Veria Living—Getting kids to unplug can be difficult; you’ll find tips for finding a balance with electronics in this article. Challies—Read this blog written from a dad’s point of view to encourage you to do certain things with your child, like going on dates with your child and praying nightly. Positive Parenting Connection—Learn how capable elementary aged kids are and make sure that you help yours embrace this age of exploration. ABC News Radio Online—Find out how you can stop yelling and discipline in a better way. The tween years are an exciting and challenging time in your child’s life. As she enters this stage, it’s likely that she’ll start to pull away from you a little bit. She’s also probably discovering who she is, defining her own style and becoming more interested in her looks. Try to keep the lines of communication open by spending one-on-one time with your tween. During this period of development she’ll encounter significant physical and emotional changes. These 10 blog articles will educate you on what you may experience and try to give you advice for dealing with any issues that arise. Dr. Michelle Borba—You’ll find advice on teaching your child how to make and keep friendships strong in this article. Care2—Read these 16 tips to avoid drama in parenting tweens. Talk with Your Kids—Find articles about all sorts of difficult conversations that you may need to have with your tween. She Knows Parenting—Because of an increase in publicity regarding the subject, bullying has become a hot topic in schools. Read what you can do about bullying and your child. Babble—Read about how the First Lady handles raising tweens in the White House and how she tells her girls to deal with the ugliness of people and politics. Psych Central—Parenting kids with ADHD (Attention Deficit Hyperactivity Disorder) can be challenging, especially during the tween years. Learn how to help your child deal with the pressure. U Know Kids—As a parent it is important that you read this article about cyber bullying and keep an eye on your tween as she becomes more involved in social media online and on her cell phone. Chicago Tribune Lifestyles—Find out what to do when your tween begins exerting her individuality. The Wellness Almanac—You may want to read this article if you are thinking about getting your tween a smart phone. Parenting—Tweens can be rude, so read this article to find advice on how to handle rude tween behavior. The teen years are often given a bad rap; however, you can circumvent some of this by keeping the lines of communication open and having a mutual respect with your child. Your child is simply growing up, and as a parent you have to come to terms with that and figure out how you’re going to help. Surprisingly, many teens still want you to set boundaries for them – they just also want your trust. You can find advice on what to do if your teen goes off course in these 10 blogs. Suite 101—Family chore charts may seem like an unusual teen topic, but having one may help reduce any drama when getting your teen to help around the house. Planning with Kids—Learn the importance of listening to your teen and talking so that he will listen to you. Money MSN—Learn about what you should and shouldn’t tell your teen driver as he begins to learn how to drive. The Herald—This article is full of advice for the parents of teens. Parenting Five—What do you do if your child is caught shoplifting? Read this article to find out. Good-Enough Parenting—Find out everything you need to know about feeding teens here. Dr. Barbara Greenberg—Read the advice that teens found most helpful so that you can make sure you give the same advice to your kids. Earnest Parenting—Implement these five tips for raising a teenage boy. Expert Beacon—Teenage drinking is a serious issue and one that shouldn’t be taken lightly; read these Do’s and Don’ts of teen drinking. Crosswalk—Dating is a hot topic during the teen years, and what you need to say and do is covered in this article. Your role as a parent becomes a little murkier when your child leaves home to go off to college. During this stage you become more of an advisor, and it’s important to let your child learn to live on his own. Your child may call and lean on you a lot as he goes through this transition period, but it’s important that you also encourage him to make his own decisions. Try to limit calls to once a week, not five times a day. While you may be missing your child and love hearing that he still needs you, it’s important that he learns how to live on his own. Otherwise he may never leave the nest. Parents that have gone through what you are going through have posted advice in these 10 blogs, so read on for some helpful insight. The Choice Blog—Learn tips for raising college students in the digital age and how you can correspond with your college student. Parenting-Blog—Read tips for preparing yourself if your college student decides to study abroad. The Talent Code—If you have a college athlete try to avoid coaching him, and definitely don’t critique his playing right after the game; the best thing you can say is that you love to watch him play. Thrifty Fun—These tips are advice from real college parents that have been through this period already. Ground Control Parenting—Help your college student build a resume and find a job using this advice. College Financial Aid Advisors—Use this article to help your child find scholarships and other financial aid. Parent Hub—Learn how to parent a college student with the advice given in this blog post. Trans4Mind—Don’t smother your college student. Try to set a weekly time when you will call and catch up, but otherwise your student should be dealing with issues on his own. The Kid’s Doctor—Find out what to do when your college student gets sick here. College Parent Central—Make a shift in your role with your child from parent to coach. Encourage him and answer questions, but don’t try to run his life. Bullying is a hot button issue right now, especially with the many student deaths that have been blamed on bullying. In these 10 blogs you can learn what signs to look for to know if your child is being bullied or if your child is a bully. There is also advice on how to make your child strong enough to reduce her chances of being bullied. The important thing about bullying is to be sure that you don’t ignore it because it may escalate and do more damage. Really, Are You Serious?—Learn how to give your child what she needs to walk away from a bully. Bullying UK—Check out the numerous articles about bullying and read the advice regarding what you should do as a parent and what you should advise your child to do. Becky Danielson—Read some tips on how to handle your child if you think she’s the bully. Children’s Medical Center—Check out the warning signs that your child may be being bullied at school. Dr. Karen Ruskin & Associates—Read how you can stop bullying and figure out what you should be looking for if your child is a bully. Motherhood Moment—As a parent you need to be the soft place for your child to come to when things go wrong. Don’t be the bully at home. Parent Society—Learn the warning signs to see if your child is at risk of being bullied or if your child might become a bully. Raising Redheads—Listen to your child and let her explain things at her own pace. Make sure you try to get the whole story in case you need to document it. We’re Just Parents—Let your child know what she should do if someone is bullying her. Parent Dish—This article gives you signs to look for to know if your child is being bullied and how you can talk to your child about it. Every parent wants her child to be confident, but how do you help your child gain confidence? From a young age you can affect how confident your child becomes. Teach her the ways to do something, then step back and let her do it. When you hover you are sending the silent message to your child that you don’t think she can succeed without you. Make sure that you give praise to your child when she has done something great, but don’t go overboard. Too much of anything makes it lose its specialness. Read through the advice in these 10 blogs to see how you can help your child become a confident person. Multiple Mayhem Mama—Read the ideas on this post about teaching your kids to cook to increase their confidence. CBN—Determine whether you are raising a confident kid or if you hover too much. Oh You Kids—Learn little things you can do to make your child more confident and less fearful. Consistent Parent Advice—Try not to solve your kid’s problems for her. Coach Apparent—Be careful to praise your child when it’s warranted, but don’t over praise. Healthy Living Tips and Advice—Give your child the chance to fail; if you are always coming to the rescue your child may think you have no confidence in her. Peaceful Parents, Confident Kids—This blogger explains her child raising methods according to RIE (Resources for Infant Educarers) as a way to let her kids be problem solvers. Canadian Living—Children that feel accepted and capable are more confident according to this blogger. Sprout Baby—It’s important to appreciate your child in whatever she does to help instill confidence. Parenting Informer— This blogger lists five hobbies that may help your child become more confident. A road trip can be one of the most exciting adventures a family will embark on together, and will help create memories that will last a lifetime. Traveling with toddlers, though, can be a challenge. Even if you have the most well-behaved toddler, expecting your child to sit still and occupy himself for the duration of a road trip is unrealistic. To avoid chaos and a drive filled with whining, crying and full-blown temper tantrums, prepare for a long road trip by planning quiet activities, games and frequent snacks to satisfy and entertain your little one. Even though you may limit your toddler’s time with tablets and electronic games at home, an iPad or Gameboy may be just what your child needs while traveling on long road trips. “With the age of technology, we have a big bonus,” says Christine Gutierrez, New York-based psychotherapist. Often, hunger cravings can cause a toddler to act out or misbehave. Prepare for a long road trip by packing a cooler of snacks and drinks to satisfy his hunger. Non-messy items, such as grapes, carrots or fruit gummies, will keep your toddler and your vehicle clean during snack time. Juice packs or milk in a Sippy cup can also comfort a sleepy toddler while traveling. 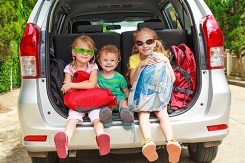 The idea of being locked inside a vehicle for hours on end doesn’t necessarily sound appealing to a young child; however, if the trip includes goodie bags filled with games and activities, she may be more than eager to jump into that car seat.